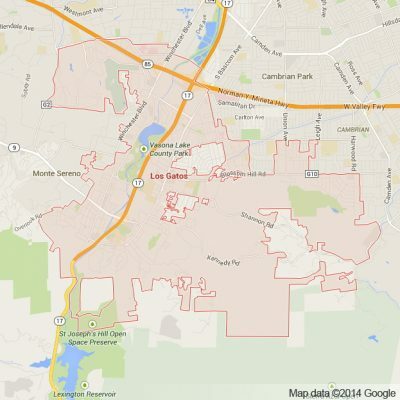 Los Gatos is an affluent community rated highly in Bloomberg Businessweek for it’s livability and incredible setting. Los Gatos means “The Cats” and is a beautiful Santa Clara County town surrounded by trees and rolling hills. Los Gatos is a thoroughfare between Santa Clara County and the Santa Cruz mountains making it both the edge of the Bay Area and the beginning of the incredible wildlife that surrounds Santa Cruz. There is an incredible network of mountain biking trails and hiking destinations making Los Gatos a perfect destination for those who like the outdoors. Vasona Park, one park among many, accentuate this natural setting that Los Gatos embodies. Surrounded by the Santa Cruz Mountains, El Sereno Open Space Preserve and Sierra Azul Open Space Preserve there are a number of options for the hiking inclined. A definite high-end community, Los Gatos is also home to a number of delicious restaurants and a small shopping district in it’s downtown. While close to Silicon Valley, Los Gatos feels like a world apart with it’s small town charm and sustainable, ecologically friendly infrastructure. Because of it’s environmental grandeur Los Gatos has become a popular destination for weddings in the Bay Area. Here at Apex Limousine Transportation we offer comprehensive wedding day limo services for all couples who are planning their wedding in Los Gatos. We understand how hectic and complicated making a wedding day run smoothly can be. For this reason our professional staff and limo drivers work directly with couples and/or their wedding planners to ensure our luxury limousine transportation services perfectly compliment your wedding day needs. We also offer Los Gatos residents limousine, sedan or luxury SUV services for a plethora of other occasions. For those professionals who need timely and reliable transportation to or from ANY Bay Area airport (SFO, OAK or SJC) our limo drivers are here to help. We guarantee timely pick ups and drop offs and are consistent with our promise to make sure you are never stuck waiting. We also offer junior prom and senior ball services for area High Schoolers. We are a favorite among parents and students of Los Gatos because we simultaneously ensure safety and that every guest has the time of their life. For Los Gatos residents who want to explore other areas of the Bay Area, Apex offers limousine transportation services to San Francisco and Napa Valley Wine Tours. Our popular San Francisco transportation services take Los Gatos residents to the city where they can enjoy restaurants, bars and other landmarks in luxury. For those who want something even more elegant, our Napa Valley Wine Tours take you and your party to world renowned wineries in the lush and beautiful Napa Valley. We promise that when riding with Apex Limousines you will have an incredible time every time. So really, what are you waiting for? Give us a call and book your adventure today! Please call us for car service all inclusive total for Los Gatos to/from Napa Valley transfer.